You'll enjoy a bit of beach vacationing at Panormos Beach and Elia Beach. Take a break from the city and head to Paradise Beach and Agios Stefanos Beach. There's still lots to do: take a stroll through Little Venice, take in the exciting artwork at The Big White Gallery, shop like a local with Tia handmade, and stop by Savvas Traditional Greek Products. 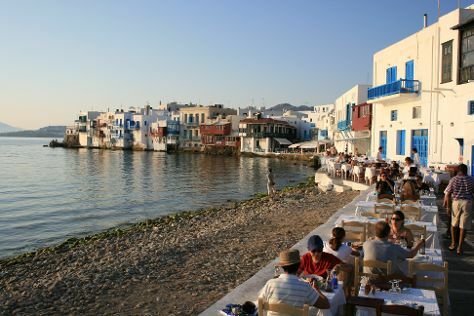 For traveler tips, where to stay, reviews, and tourist information, read Mykonos Town trip itinerary builder . Montreal, Canada to Mykonos Town is an approximately 14-hour flight. You can also do a combination of flight, taxi, and ferry; or do a combination of flight and ferry. You'll lose 7 hours traveling from Montreal to Mykonos Town due to the time zone difference. Plan for a bit warmer nights when traveling from Montreal in May since evenings lows in Mykonos Town dip to 20°C. Wrap up your sightseeing on the 14th (Tue) early enough to ride a ferry to Paros. Head to ONEIPA Concept Store and Yria Ceramic Studiofor plenty of shopping. 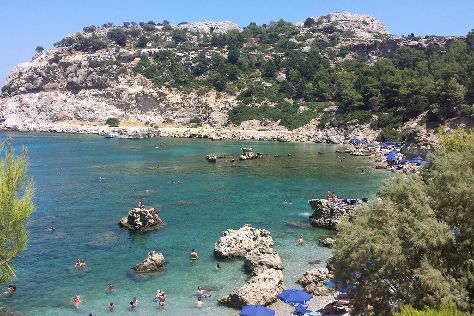 Your itinerary includes some good beach time at Piso Aliki Beach and Kalogeros Beach. There's much more to do: step off the mainland to explore Parikia Town, Head underground at Marathi Marble Quarries, contemplate in the serene atmosphere at Panayia Ekatondapiliani Cathedral, and enjoy the sand and surf at Voutakos Beach. 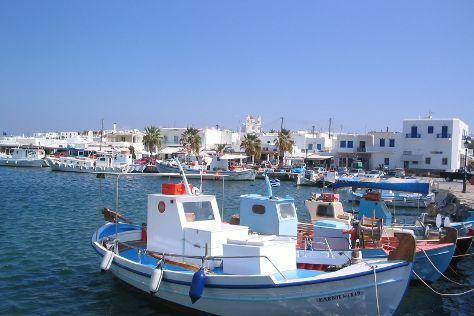 Before you visit Paros, use our trip planner to discover what you can do and see there. Traveling by ferry from Mykonos Town to Paros takes 1.5 hours. In May in Paros, expect temperatures between 27°C during the day and 19°C at night. Finish up your sightseeing early on the 17th (Fri) so you can catch the ferry to Ios. On the 18th (Sat), tour the pleasant surroundings at Manganari Beach and then enjoy the sand and surf at Kolitsani Beach. For photos, traveler tips, maps, and tourist information, read our Ios travel planning tool . Traveling by ferry from Paros to Ios takes 1.5 hours. In May in Ios, expect temperatures between 27°C during the day and 19°C at night. Wrap up your sightseeing on the 18th (Sat) to allow time to ride a ferry to Fira. Do your shopping at Aquamarine Jewelry and MATI Art Gallery. Visit Red Beach and Perissa Black Sand Beach for some beach relaxation. Get out of town with these interesting Fira side-trips: Akrotiri (Caldera Beach & Santo Horse Riding), Mnemossyne Gallery (in Oia) and Eduart Gjopalaj (in Kamari). The adventure continues: kick back and relax at KAMARA BEACH, get a taste of the local shopping with Art Space, explore the ancient world of Akrotiri, and explore the activities along Amoudi Bay. To see where to stay, photos, ratings, and more tourist information, use the Fira trip planner . Fira is very close to Ios. May in Fira sees daily highs of 28°C and lows of 20°C at night. Wrap up your sightseeing on the 23rd (Thu) to allow time to travel to Faliraki. Kick off your visit on the 24th (Fri): enjoy the sand and surf at Faliraki Beach. Keep things going the next day: tour the pleasant surroundings at Agathi Beach, then enjoy the sand and surf at Lindos Beach, then view the masterpieces at Artistic Village Contemporary Art - Art gallery & Museum of Ceramic Art, and finally get into the urban bustle at Kallithea Springs. For maps, reviews, other places to visit, and tourist information, use the Faliraki trip itinerary planning tool . Traveling by combination of flight and bus from Fira to Faliraki takes 5.5 hours. Alternatively, you can do a combination of ferry, bus, and flight; or ride a ferry. In May, daytime highs in Faliraki are 27°C, while nighttime lows are 20°C. Finish up your sightseeing early on the 25th (Sat) so you can travel to Athens. Head to Ermou Street and The Loomfor some retail therapy. There's lots more to do: take a stroll through Plaka, take an in-depth tour of Acropolis Museum, get into the urban bustle at Athinais, and explore the world behind art at National Archaeological Museum. For where to stay, more things to do, maps, and other tourist information, read Athens online holiday planner . Getting from Faliraki to Athens by combination of bus and flight takes about 4.5 hours. Other options: ride a ferry. In May in Athens, expect temperatures between 29°C during the day and 20°C at night. Finish up your sightseeing early on the 31st (Fri) so you can travel back home.